I gotta say, I love me some beets, but when I go to the bathroom after I’m always a lil’ shocked. DId something happen? Am I okay? Then I remember…oh, the beets! 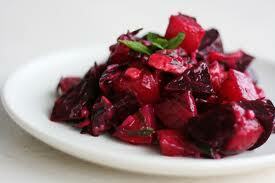 Beets can cause ‘beeturia’. 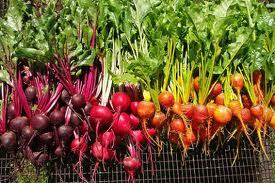 The red color seen in beeturia is caused by betalain pigments in beetroot that doesn’t get properly digested. This pigment needs to be excreted and when it does the urine is turned a pink or even a red color. The chemical that prevents the pigment from being properly metabolized is called oxalic acid (a lil’ extra nugget for you). In general, consuming large amounts of anything will cause the body to try to remove the excess nutrients (even things that are good for the body) as waste. I tend to enjoy an excess of beets when I eat them so this is most likely the reason for my beeturia, but beeturia is also common in cases of iron deficiency. There are occasions the urine even has a shade of purple from the presence of a pigment called betacyanin (not happened to me, just fully informing you). While it can be quite psychologically distressing (If you’re like me the initial, “Holy Sh!t, I’m bleeding out”) to see pink, red, or purple urine, the truth is that beeturia is one of the least harmful causes for a strange color to appear in your urine. PHEW…so, go on…enjoy your beets! This entry was posted in FIERCE HEALTH, FIERCE SOUL, FIERCE- ISH and tagged balance, Beets, body, fitness, health, mindful eating, minerals, nutri, self improvement, strength, wellness by GETFIERCE TRAINING. Bookmark the permalink.